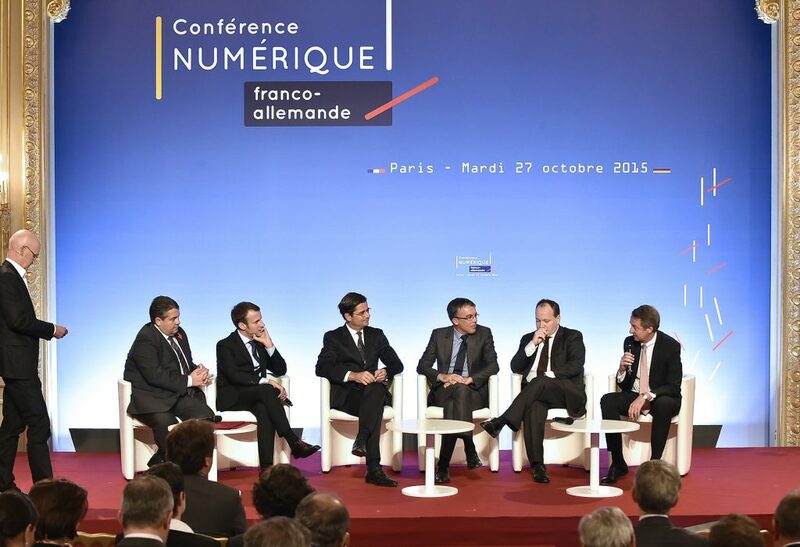 The debate was sparked by a picture of a panel composed exclusively of men at the Franco-German Digital Conference that took place at the Élysée Palace in October 2015. This in turn was the food for thought that led to the creation of the #JamaisSansElles movement. What is the link between Angela Merkel, a conference at the Élysée Palace and a club for digital entrepreneurs? Answer: #JamaisSansElles! 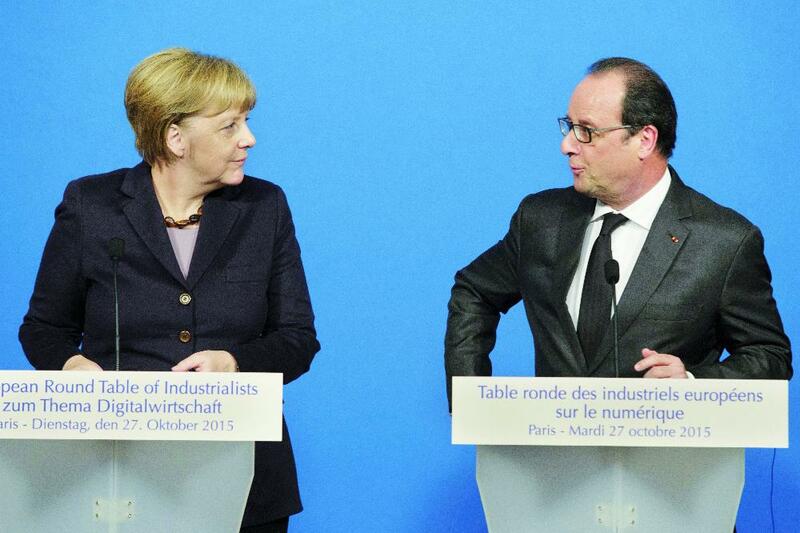 On October 27, 2015 a Franco-German conference on digital affairs was held at the Elysée Palace. 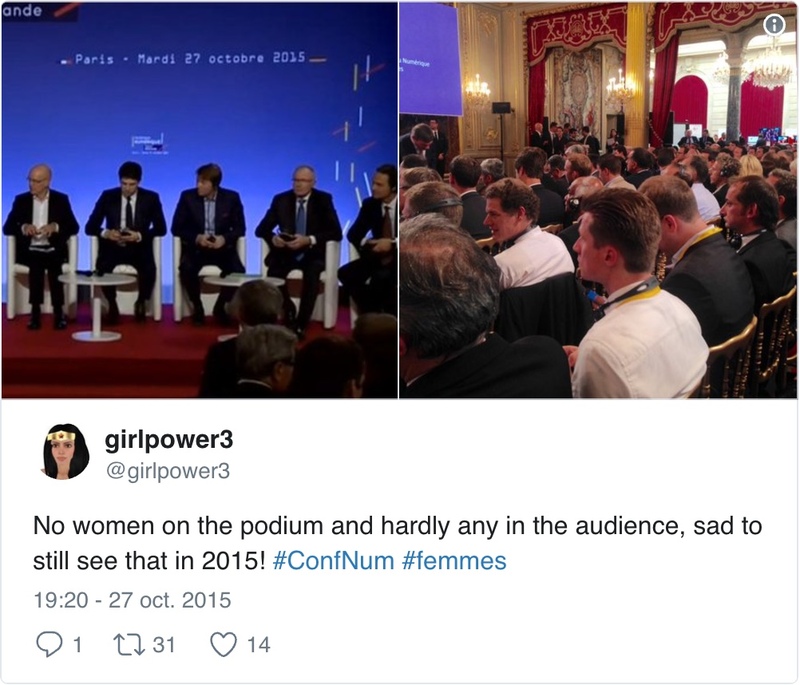 Is it because the conference took place in the presence of Angela Merkel that the picture of the panel composed exclusively of men seemed particularly objectionable? The debate that ensued on Twitter was intense (see tweets below). 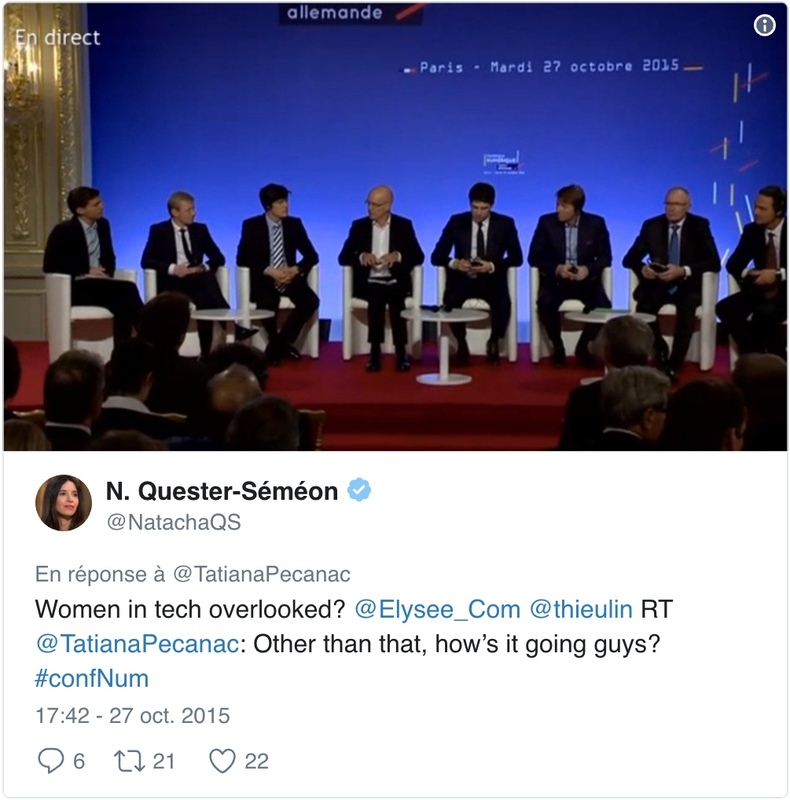 Axelle Lemaire, former Secretary of State for Digital Affairs, responded quickly, as did men like Benoît Thieulin (president of the CNNum) and Guy Mamou-Mani (President of Syntec Digital). The latter is quoted in Le Point magazine as saying: “It was that tweet that suddenly made me realize the incongruity of the situation. The event was made up exclusively of men”. That same day on Twitter he made a commitment in less than 140 characters: to refuse to participate in any conference where there are no women. Henri Verdier in turn made the same commitment on Twitter as well. 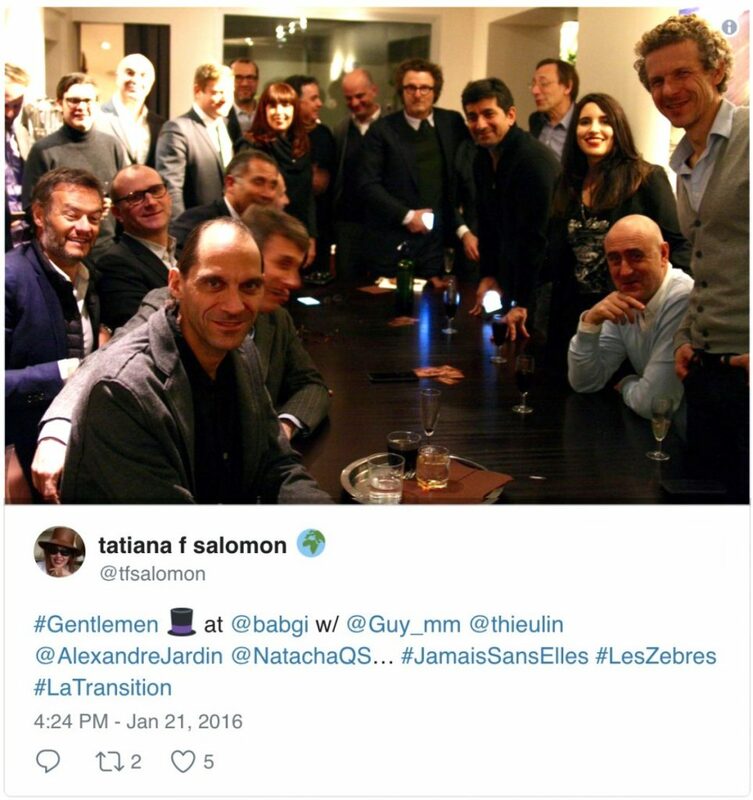 Club des Gentlemen, January 2016: Tatiana F-Salomon, Guy Mamou-Mani, Gilles Babinet, Jean-Michel Blanquer, Natacha Quester-Séméon, Benoît Thieulin, Sylvain Attal, Alexandre Jardin, David-Hervé Boutin, François Momboisse. 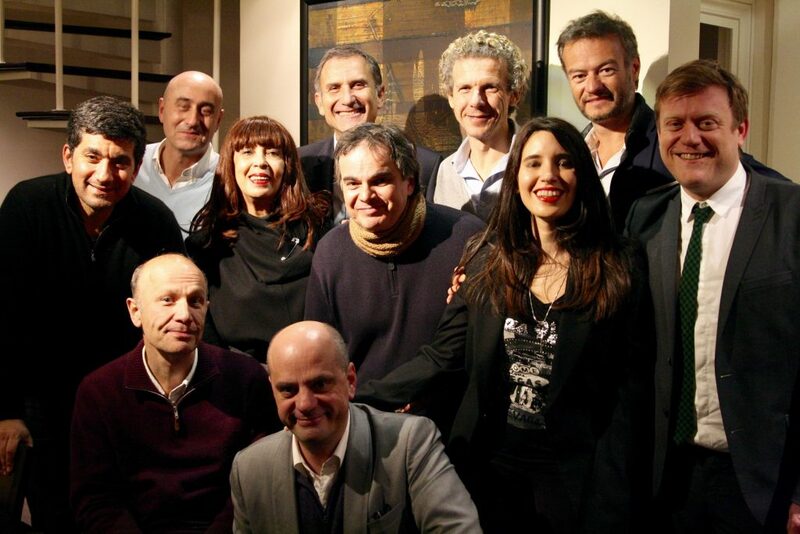 A few weeks later, all the protagonists involved in the discussion came together at Gilles Babinet’s for a meeting of the Club des Gentlemen which included Benoît Thieulin and Jean-Michel Blanquer, Xavier Alberti, Herni Verdier, Rubin Sfadj, Etienne Parizot, Alexandre Jardin, etc. The group which includes entrepreneurs, influential people in Tech, humanists, participants in and promoters of public debate, all involved in the digital transformation of society, is presided over both by Tatiana F-Salomon and Guy Mamou-Mani. They both proposed to launch a joint appeal. That same evening the group agreed on the name for their endeavour: Thus was born #JamaisSansElles! The following day Tatiana wrote the Pledge, which was published in Le Point magazine on January 23, 2016. The fact that men were becoming involved and committing themselves individually alongside women in favor of diversity and gender equality proved rapidly to be a tremendous asset. The flow of tweets and positive reactions circulating on Twitter surprised the initiators of the movement. Two hours after the publication of the Pledge, the hashtag ended up in trending topics. Instant success. 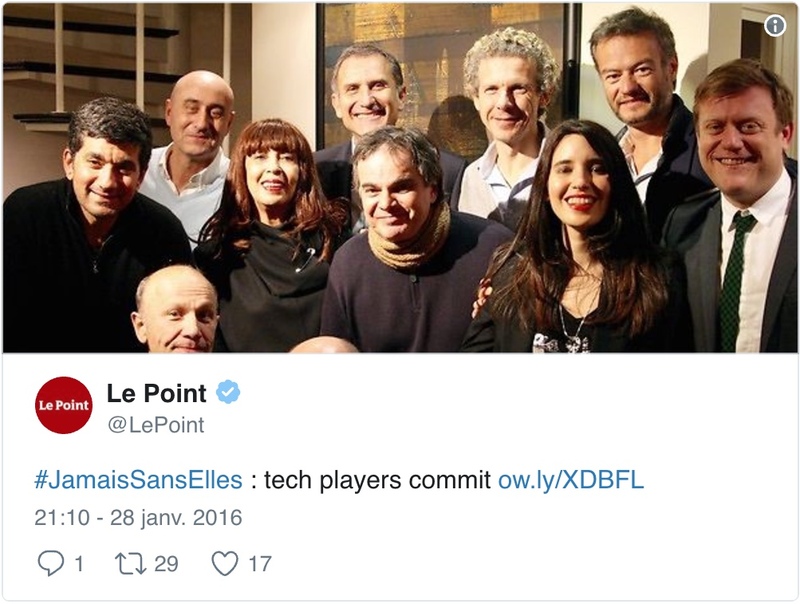 High-ranking personalities committed themselves: Alain Juppé, Jacques-Antoine Granjon, Nicolas Sekkaki, Philippe Saurel. Forty or so leaders spontaneously became a part of the initiative. The novelty and the disruptive nature of the #JamaisSansElles concept has made the hashtag one of the most shared online in its category (see our top 10 from 2016 – 2019), and established the movement that accompanies it as a key player in the field. 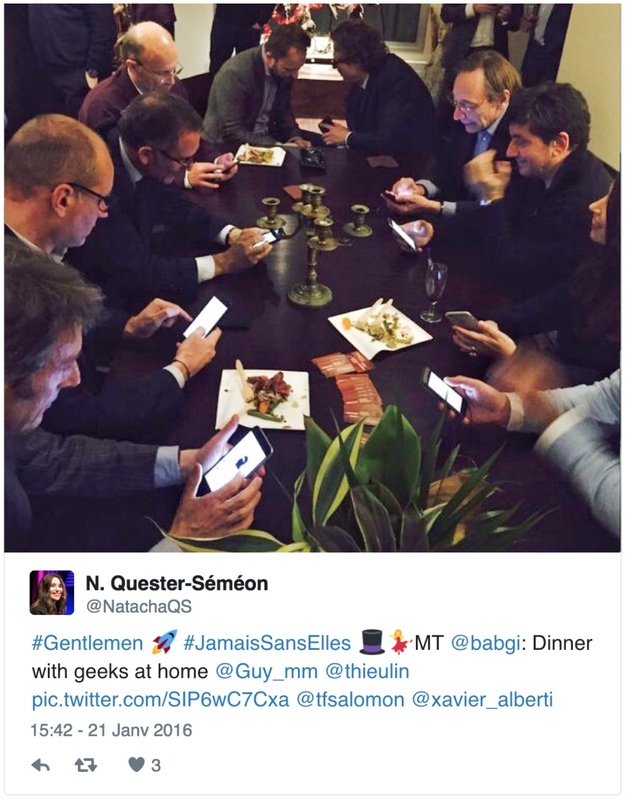 In fact, the Gentlemen are very active on Twitter and have, all told, more than 600,000 followers. 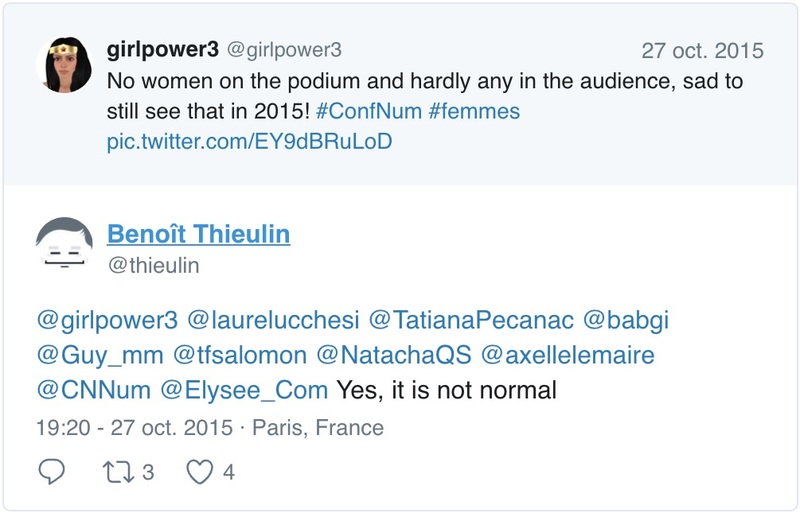 The movement has become an association with a women’s council, including Laurence Parisot and Nathalie Kosciusko-Morizet, whose members have 1.2 million followers. Conference organizers also have been surprised by the wave of highly acclaimed leaders who have committed themselves. The enthusiasm for #JamaisSansElles has propelled the question of gender equality to centre stage: the composition of panels, TV programs, and boards of directors, the place of women in culture, science and sports, everything is seen in terms of gender equality and the recognition of the role, the legitimacy, and the presence of women alongside men in the public eye! In the face of what is not a new public demand but rather a newly emerging one that is easy to communicate, events organizers are sometimes taken unawares and have begun to ask #JamaisSansElles to find speakers. Understanding the importance of the issues and wishing to join the movement, some even undertake the process of obtaining the #JamaisSansElles label for their conferences, establishing rules relating to gender equality and balance that are much more rigorous than those they previously observed. The movement has also received unexpected public reactions and support. The vibrant twitter community contributes to fact checking signatories and events. The public keeps watch and shares. A picture of an event that is composed exclusively of men leaves a strong impression on both men and women. The time for simple declarations and demonstrations of good intentions is over. The community that has united with #JamaisSansElles is very committed. It has broadened the scope of the messages, developed its notoriety nationwide, and given wing to #JamaisSansElles, which has gone viral. 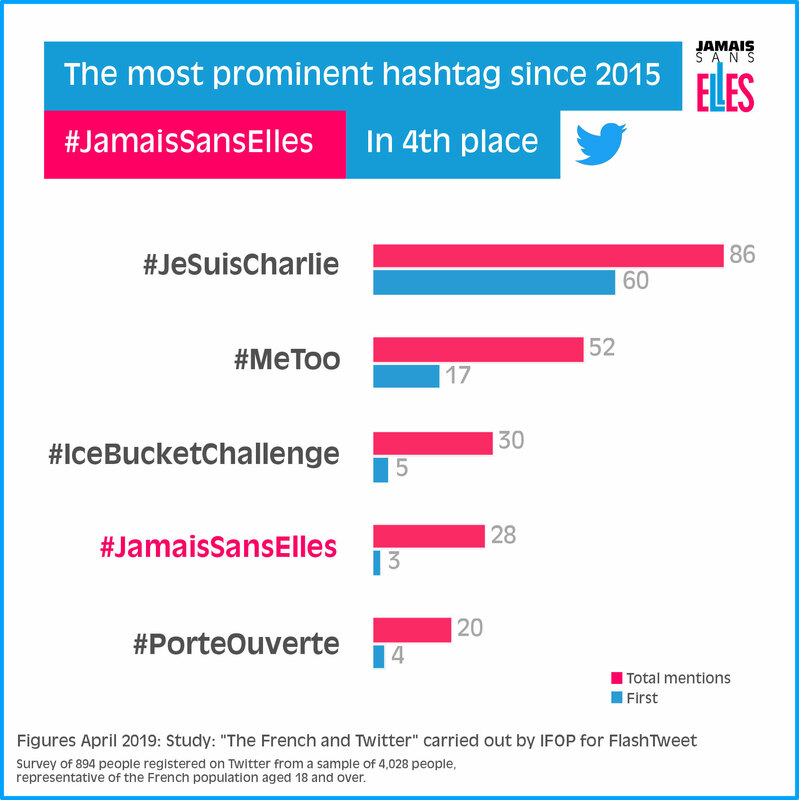 #JamaisSansElles is the fourth most significant hashtag of a collective movement since 2015, coming after #JeSuisCharlie, #Metoo and #IceBucketChallenge, according to the Ifop Opinion study “The French on Twitter” made for FlashTweet. The hashtag #JamaisSansElles collects 28% of mentions when users of Twitter France are asked to list the most prominent hashtags. Far from being a one-off occurrence, the hashtag is alive and well and has continued to grow over the past 36 months. Every day the hashtag is used to share news and comments and to raise awareness of issues relating to diversity and gender equality. It has become a powerful vehicle in getting citizens, decision-makers, events organizers and politicians to talk about the lack of women in public discussions and institutions. Some figures measured with Talkwalker*: from January 2016 to March 2019, the hashtag #JamaisSansElles has been associated with more than 200,000 tweets and retweets, posted by nearly 50,000 contributors. In all, this generated more than 350,000 commitments on Twitter (retweets, favorites, comments) and an average monthly reach of 35.5 million accounts reached*. The relevance of the approach and the political impact of the substantial work carried out over the course of several months was felt during the 2017 presidential elections. The appointment of women in the government of Edouard Philippe has been widely discussed in various morning/evening radio and television news programs. However, in addition to these appointments, and this is something new, the allocation of key positions in ministerial cabinets and in the National Assembly has been carefully examined. Clearly, the place of women in political representation has become mainstream, and it is obvious that digital gender equality is not enough: it is “qualitative equality” that is in debate. What is meant here is gender equality in all spheres of decision-making and influence. Including in the heart of the Élysée Palace, which, alas, remains almost exclusively a male domain. The reason so much attention was paid to balance and gender equality after the 2017 elections is also because the work had been started very early on in the presidential campaign. Tatiana and Natacha, the founders, have extensive experience in grassroots social engagement and, for the past twenty years or so, in digital empowerment, via the Association Les Humains Associés (created in 1984 and web pioneer since 1994). The community realises it supports the work by sharing on social media. Although this does not require traditional means of communication or marketing campaigns, the scope of the messages, which function in a much more organic way, is all the greater nonetheless. From its very inception, the principles of #JamaisSansElles have been adopted in many countries throughout the world. In October 2016, 10 Danish deputies announced on twitter their commitment to #JamaisSansElles, thus launching a widespread discussion in Denmark. In April 2018, Michael Roth, the German Minister for European Affairs, became a #JamaisSansElles signatory. He invited our co-chair, Tatiana F-Salomon, to Berlin last September as guest of honor at the 2018 Europe Fest, which took place at Villa Borsig, the guesthouse of the German Foreign Ministry. At the international level, the movement is the Women 20 French delegate, the G20 official engagement group, which brings together women entrepreneurs’ organizations from around the world. * All data comes from the Talkwalker reference measurement tool. The number of mentions indicates the number of times a tweet or retweet with the hashtag has been counted. The reach indicates the number of potentially affected accounts, that is, potentially exposed to tweets including the hashtag. This is the set of followers of the sending accounts’ tweets at time t.